Luggage bags printed with your chosen corporate logo will spread your advertising message far and wide, not just within the UK but wherever your clients travel to across the world! These promotional bags come in many variations to! From the pull along trolley to the promotional gym bags, there are styles to suit all businesses. 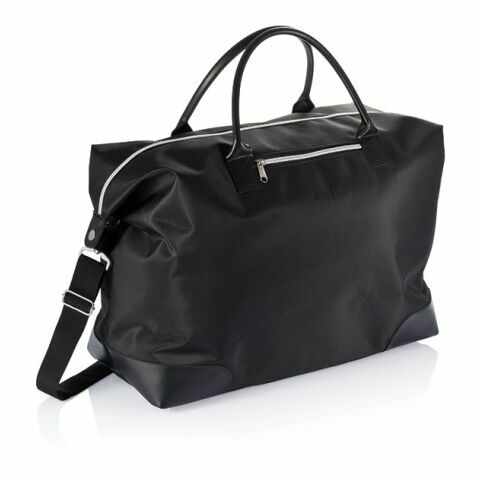 There are weekend bags as well as sports ones, large and durable enough to hold a whole range of bulky and heavy items. All of the styles available can be customised by having your business design printed on the front. As your clients walk across the airport with their promotional luggage in hand, they are sure to attract attention from many onlookers who will all be exposed to your business. Many companies are already making use of printed bags and suitcases to raise the awareness of their brand as their recipients travel. These corporate gifts would be particularly effective for those operating in the travel industry. An airline, travel agent or event planner to name just a few! Your customers will take their promotional products with them on holiday and when they return, good memories will always be attached to your brand. The large surface area of these bags ensures that your logo will be seen from far away, spreading awareness of your company. Promotional luggage can be given as corporate gifts to employees or business partners who will be grateful for such a useful and practical gift. To go with the luggage, you could fill it with other personalised items such as branded notebooks, printed messenger bags, keyrings, folders, pens and pencils. These accessories will make the gift look that much more thoughtful and strengthen the relationship between client and business. We stock high-quality materials made from polyester and fabric, these are hardwearing, durable bags that will be used by your clients for many years, creating endless exposure for your company in that time! Holdalls make brilliant promotional items because they are big enough to hold a good amount of items but compact enough to be easily transport by hand. These would make appropriate gifts for work colleagues and business partners and will be used often due to the practicality of the product. Luggage in striking colours and emblazoned with your corporate design is sure to catch the attention of all bystanders. These promotional bags can be give with case belts, luggage scales, luggage tags, all available on our website. Here, the baggage meets not only the purpose of the flexible and universal advertising opportunity but also remains fully functional and convenient to the traveller in the partially hectic atmosphere at an airport. This functionality paired with high-quality materials and bold look will ensure your company remains in the customer’s mind. The styles available range from big to small, with wheels and without, with handles and with carry straps. Once you have chosen the style that most aligns with your brand, you can choose your preferred colour and the have your business logo printed on the front. We offer a speedy service from enquiry to delivery. If you have any questions on the process, do not hesitate to contact our team. We here at allbranded are happy to help!